Our Department is located in the engineering complex on the east edge of the MSU campus, near the corner of S. 7th Ave. & W. Grant St.
Bozeman, Montana is located on Interstate 90. Two interstate exits will bring you to the MSU campus in Bozeman. If arriving from the west on I-90, take Exit 305 onto North 19th Avenue. Once on 19th Avenue heading south, follow the road to Kagy Boulevard (approximately 3.5 miles). Turn left onto Kagy and continue to South 7th Avenue (no traffic light). Turn left and continue to the Pay Parking Lot located south of where 7th Avenue meets West Grant Street. From the east, take Exit 309 onto Main Street, proceed west to Willson Avenue, turn left, and travel 18 blocks to Kagy Boulevard (Willson will curve slightly here, and there is a traffic signal). Turn right and continue to South 7th Avenue, turn right again, and continue to the Pay Parking Lot located south of where 7th Avenue meets West Grant Street. Bozeman's airport is located several miles northwest of the city. From the airport, follow the departure signs to Airway Blvd., proceed through the intersection and traffic circles, and turn left (east) onto Interstate 90 (Exit 299). After five miles take Exit 305 onto North 19th Avenue. Once on 19th Avenue heading south, continue approximately 3.5 miles to Kagy Boulevard. Turn left (east) onto Kagy and continue about 0.7 miles to South 7th Avenue (no traffic light). Turn left (north) and continue to the Pay Parking Lot located south of where 7th Avenue meets West Grant Street. Once on the campus, look for Cobleigh Hall just east of the Student Union Building. Cobleigh is a 6-story red brick building. There are two elevators located on the main floor of Cobleigh, one in the middle of the north hallway and one in the middle of the south hallway. Take either elevator to the 6th (top) floor. 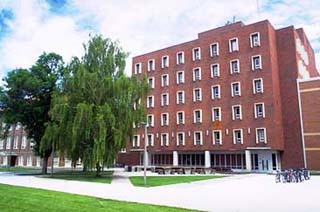 The ECE Department main office is in the east corridor of the 6th floor, room 610. Phone: 406-994-2505. Office hours are Monday-Friday, 8AM-noon and 1PM-5PM. Campus map and parking guide (.pdf). Unfortunately, there is no free parking on campus, and parking is not allowed during the day on the residential streets surrounding the campus. A parking permit is required to park anywhere on campus Mon-Fri between 6AM and 6PM. You may purchase a daily visitor parking hang-tag ($4.00) at the University Police station (7th and Kagy) and seek a space in one of the regular parking lots designated SB, D, E, F, or FH. Parking is also available in the Parking Garage. Enter the Garage from the access driveway on 7th Ave. just south of the construction area at the corner of 7th and Grant. Enter the Garage and park in one of the hourly spaces, which are delineated by white striping and white numbers. Park in a white space, then walk to the payment kiosk and use a credit or debit card to purchase a time permit, then return to your car to display the permit on your dashboard. Parking Garage pay rates are $3.50 for the first hour, $1.50 for each additional hour, to a maximum of $8.00. Enforcement in the Garage is 6AM-8PM. Since August 1, 2012, the entire Montana State campus (indoors AND outdoors) is designated tobacco free. We request that you refrain from tobacco use for the rest of your life (!) --or at least until you have left MSU property. The ban on tobacco use includes all owned and leased buildings, campus streets, residence halls, outdoor areas, parking lots, and athletic facilities. The prohibition includes smoking, chewing tobacco, using e-cigarettes, and any other nicotine carrier that has not been approved by the FDA for nicotine cessation.